This is part 6 of 10 of the Survival Shooter tutorial, in which you will program the player's health, which is used in reference by other elements of the game. we now want to actually implement that. also interact with our UI that we just created. the ability to take that health away. we should find a script called PlayerHealth. Player Health Script as a component. it'll zoom us right in there. before we do be sure to save your scene. And let's go ahead and pop this open. see what each of these are. when the level first starts. after they've been damaged or just at any given point in the game. which is the new UI. any of the new UI components. So just keep in mind you have to have that. We have an audio which is our death clip. when the player loses the game. flashes up on the screen. of the way completely opaque. So it's mostly transparent and red. So this is the first time we've seen this. running around once the player is dead. you're seeing some script interactivity there. which will determine whether or not the player is dead. to know whether or not the player has taken damage. we've created we just use the name of that script. Again we have some comments in our code. We'll revisit this script and re-enable that later. Update method, our update method's really simple. immediately, it's going to flash this red. and then we're going to fade it back to transparent. And we do that again using Lerp. but instead of vector3s we're doing color. the camera as it would follow the player around. color that it is all the way to transparent. we're setting damaged equal to false. to false after showing that damaged image. in that it's not called in this script. again that script interactivity is important. It has to be public or else this isn't going to work. int amount, which is how much damage the player has taken. the player flashes that red image. So we do that by saying damaged equals true. We detract the amount of damage from our current health. so basically it just reduces by that amount. parse it in to the value of our slider. shrink as the player takes more damage. and we gave it that Player Hurt audio. going to play that hurt audio. making them dead if they're already dead. If that happens we're going to call a new function called Death. Death is a function that is in this script. It's not built in to Unity or anything like that. It's actually the very next function we're going to look at. and here's what the Death function does. isDead equal to true, saying 'yeah, okay, player is dead'. Next we've got some disabled code, we'll come back to that. parameter which was Die which was a trigger? when they lose the game. we added as a component. which basically means no more movement. 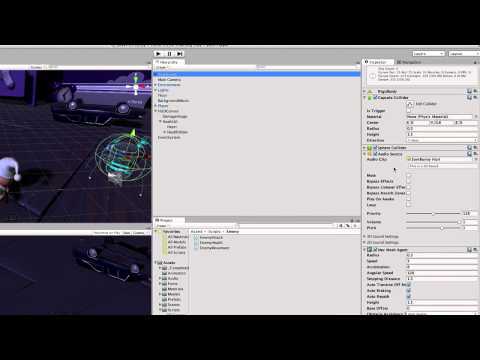 return to the Unity editor. put that script on to the right game object. filling in some of these values. it'll be set in the awake function. But here we have this Health Slider property. script that we've just added. and right here we have our HealthSlider. with this Player Health script. So now we can update the health via the slider. down in to the Damage Image property in the script. and we'll see that that gets added there. health the UI system reacts, and all that's done. see the interactivity of our game objects. and we're going to locate the EnemyAttack script. and drag that on to the Zombunny. Let's go ahead and open up EnemyAttack. but again we're going to start with a few public variables. And then we also have a public integer, which is the attackDamage. attacks done to the player. store our reference to our animator component. but it needs to have some reference to that player. We have a reference to the PlayerHealth script. that is on a different game object. so that the enemy can then damage the player. and then we have a boolean value playerInRange. not too fast, not too slow. and store that reference locally. or every time we need it. the performance of our games and projects. off that player, and again, storing a reference to it. call that public function takeDamage we saw previously. to setup a reference to our animator component. for detecting collisions and stuff behind the scenes? it doesn't react physically, because it's a trigger. and then inside parenthesis we have (Collider other). are Other is the player. And so now I know where that is. 'are these the same thing?'. cool, okay, then we can attack it. If that's true then we set playerInRange to true. and it has now gone away. Alright, that's just the complete opposite. was the thing that left the trigger the player? in range, so we set that to false. 'no, they're not close enough any more'. 'Hey they're close enough, no they're not close enough any more'. this is just how we determine whether we're close enough. The actual attacking happens in the update. do is we determine how much time has occurred. a little bit bigger and it represents how much time has passed. we're going to attack the player. And we can see that we call the function Attack. Then finally we'll look at Attack here in a second. moving state to the idle state. 'well that was fun, now what?'. And so that's how we stop chasing the player around. and this is what the Attack function looks like. The first thing we do is we reset Timer. We're now attacking so Timer is set back to 0.
let's take some of that away. and we parse in however much damage this enemy does. transition in to the idle state. what we've just done here. Why not test this? Let's pop back over to Unity. Will, go ahead and get eaten! and man, that Zombunny is relentless! I don't think he wants to give you hugs. The damage image there is quite faint. a bit more harshly, like that. the alpha of the color on the Player Health script. public int startingHealth = 100;                            // The amount of health the player starts the game with. public int currentHealth;                                   // The current health the player has. public Slider healthSlider;                                 // Reference to the UI's health bar. public Image damageImage;                                   // Reference to an image to flash on the screen on being hurt. public AudioClip deathClip;                                 // The audio clip to play when the player dies. public float flashSpeed = 5f;                               // The speed the damageImage will fade at. public Color flashColour = new Color(1f, 0f, 0f, 0.1f);     // The colour the damageImage is set to, to flash. Animator anim;                                              // Reference to the Animator component. AudioSource playerAudio;                                    // Reference to the AudioSource component. PlayerMovement playerMovement;                              // Reference to the player's movement. PlayerShooting playerShooting;                              // Reference to the PlayerShooting script. bool isDead;                                                // Whether the player is dead. bool damaged;                                               // True when the player gets damaged. // Setting up the references. // Set the initial health of the player. // ... set the colour of the damageImage to the flash colour. // ... transition the colour back to clear. // Reset the damaged flag. // Set the damaged flag so the screen will flash. // Reduce the current health by the damage amount. // Set the health bar's value to the current health. // Play the hurt sound effect. // ... it should die. // Set the death flag so this function won't be called again. // Turn off any remaining shooting effects. // Tell the animator that the player is dead. // Set the audiosource to play the death clip and play it (this will stop the hurt sound from playing). // Turn off the movement and shooting scripts. var startingHealth : int = 100;                             // The amount of health the player starts the game with. var currentHealth : int;                                    // The current health the player has. var healthSlider : Slider;                                  // Reference to the UI's health bar. var damageImage : Image;                                    // Reference to an image to flash on the screen on being hurt. var deathClip : AudioClip;                                  // The audio clip to play when the player dies. var flashSpeed : float= 5f;                             // The speed the damageImage will fade at. var flashColour : Color = new Color(1f, 0f, 0f, 0.1f);      // The colour the damageImage is set to, to flash. private var anim : Animator;                                              // Reference to the Animator component. private var playerAudio : AudioSource;                                    // Reference to the AudioSource component. private var playerMovement : PlayerMovement;                              // Reference to the player's movement. private var playerShooting : PlayerShooting;                              // Reference to the PlayerShooting script. private var isDead : boolean;                                                // Whether the player is dead. private var damaged : boolean;                                               // True when the player gets damaged. public float timeBetweenAttacks = 0.5f;     // The time in seconds between each attack. public int attackDamage = 10;               // The amount of health taken away per attack. Animator anim;                              // Reference to the animator component. GameObject player;                          // Reference to the player GameObject. PlayerHealth playerHealth;                  // Reference to the player's health. EnemyHealth enemyHealth;                    // Reference to this enemy's health. bool playerInRange;                         // Whether player is within the trigger collider and can be attacked. float timer;                                // Timer for counting up to the next attack. // ... the player is in range. // ... the player is no longer in range. // Add the time since Update was last called to the timer. // ... tell the animator the player is dead. // ... damage the player. var timeBetweenAttacks : float = 0.5f;     // The time in seconds between each attack. var attackDamage : int = 10;               // The amount of health taken away per attack. private var anim : Animator;                              // Reference to the animator component. private var player : GameObject;                          // Reference to the player GameObject. private var playerHealth : PlayerHealth;                  // Reference to the player's health. private var enemyHealth : EnemyHealth;                    // Reference to this enemy's health. private var playerInRange : boolean;                         // Whether player is within the trigger collider and can be attacked. private var timer : float;                                // Timer for counting up to the next attack.